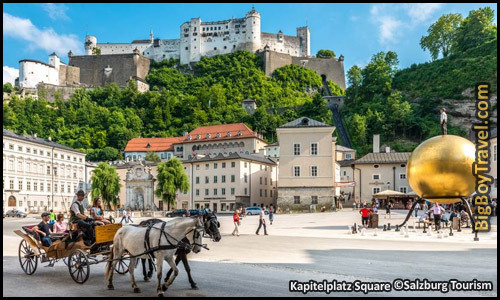 Our free Salzburg walking tour focuses on beautiful Old Town (Altstadt), which is well known as the home of Mozart and the setting for the hit movie The Sound of Music. From its Alpine surroundings to its robust history, and rich architecture, it is no wonder that so many visitors flock to Salzburg’s Old Town each year. The city center is very compact, and you will be able to breeze through the main sights thanks to our free Salzburg walking tour map. We like to start this Salzburg walking tour early in the morning, sometimes even right dawn when the Mirabell Palace Gardens are opening. Starting early in the day is a great way to avoid feeling rushed and will give you plenty of extra time to explore the walking tour sights, shop on Getreidegasse, or to just stop and relax. We hope you enjoy our free Salzburg walking tour! The core of Old Town Salzburg’s history started as a Celtic settlement which the Romans developed into a formal town of Luvaum (controlled from 15BC-488AD) complete with a large forum. Luvaum (pronounced U-Va-Voom) sat right at the intersection of two trades routes, and because of an abundance of nearby white gold (salt), the town was gradually renamed Salzburg (meaning Salt Fortress) during post-Roman redevelopment. Our free Salzburg walking tour will cover the in-depth history of the town. Throughout its almost 500 years of independent rule by Prince-Archbishops (1213–1803), medieval Salzburg grew quite wealthy and full of elegant Baroque architecture. The city grew especially powerful in the 1500s which led to a lot of Italianate redevelopment in Old Town. A vibrant local culture also sprung up in Salzburg, and as the home of the famous composer, it became known as the city of Mozart. Salzburg’s city center was lucky enough to retain its beautiful by avoiding The 30 Years War and by suffering relatively minor damage during WW2. Because Salzburg’s Old Town has kept much of its original charm, the hills are very much still alive with The Sound of Music. About Sacher Cafe: The Sacher Café is known for having the best slice of chocolate cake you can find anywhere. Their world-famous cake, known as the Original Sacher-Torte, was the creation of Austrian chef Franz Sacher who was asked to make a dessert for a Royal party in 1832 while only 16 years old. Word of the Sacher’s amazing cake spread and he quickly became a household name. Forever known as the family of rich cake, Sacher’s son opened the Sacher Hotel and Café in Vienna in 1876 and spared no expense decorating every elegant detail. With over a century of success, the Sacher business expanded to Salzburg in 1988 with their riverfront location and has become a local staple ever since. The fancy sit down area is wonderful, but they also have outdoor umbrella tables facing the river and a takeout shop where you can even have desserts shipped back home. They actually have a wide range of food and can be a good breakfast option. If you are confused and which coffee goes best with the cake, the traditional drink in Vienna is hot black coffee with foamed milk and whipped cream. If Sacher is too busy for some reason, you can also great a great bite to eat next door at the Cafe Bazar. Coffeehouse culture is an essential part of Austrian culture and stopping at one while on this free Salzburg walking tour is a must. Hours: Daily 7:30am-11pm. Website: Here. 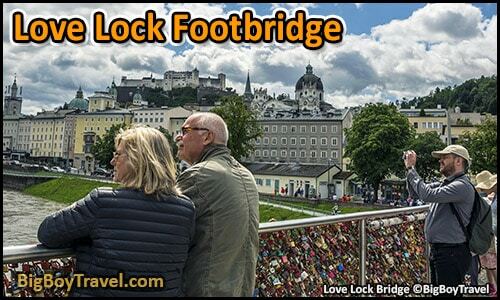 About The Love Lock Bridge: While other tourist destinations around Europe like Paris have crackdown down and banned love locks, the romantic city of Salzburg has embraced it. Every day the long pedestrian & bike-only Makart Footbridge (Makartsteg) is lined with tourists leaving paddle locks in hope for good luck. Some wish for lasting romance with the person they love while others memorialize someone they have lost, but all do it in the hopes of returning to Salzburg someday. Many of the locks have custom messages or initials written on them and once locked you throw away the key to make your wish come true. The first bridge here was completed in 1905 and named after 19th-Century painter Hans Makart. It had to be rebuilt in 1967 following damage in WW2, but the bridge would sway so much with the ever increasing foot traffic that it had to be re-designed for its grand opening in 2000. While admiring the love locks, or leaving one yourself, make sure to take in the beautiful panoramic views of Old Town. Many of the interesting things you see from the Love Lock Bridge we will see later on this free Salzburg walking tour. You can also see the boat docks on the Southern bank of the bridge where Salzburg’s river cruises leave from. About Mozart’s Residence: Welcome to the house that Wolfgang Amadeus Mozart lived in with his family from age 17 to 25. We will cover the more popular home where Mozart was born later in this free Salzburg walking tour, but we love this building which is often overlooked by tourists. After returning from a European music tour in 1773, the Mozart family realized they had outgrown their original Salzburg home and needed to upgrade. Mozart’s dad Leopold decided to move the growing family to the sizeable Dance Master House (Tanzmeisterhaus) building you see before you. They rented half of the building, complete with 8 spacious rooms, which later became known as the Mozart Residence (Wohnhaus). Amadeus produced many famous works in their apartments in Dance Master House (Tanzmeisterhaus), and the family thrived in their new social environment. After 8 years in the Wohnhaus, Amadeus was ultimately driven from Salzburg in 1781 after an argument with the Archbishop and moved to Vienna. Mozart had long felt he was under the thumb of the Archbishop and wanted more personal and creative freedom outside of Salzburg, although his father was upset by the move. Two years later, Mozart’s beloved sister Nannerl moved to nearby Saint Gilgen Austria after marrying the city’s administrator, but oddly left her newborn baby here at the Wohnhaus with her dad Leopold. After Leopold died in 1787, the home changed hands many times over the years and was later heavily damaged by WWII bombings. Decades after the WWII, with Salzburg’s tourism on the upswing, the Mozarts’ Residence was faithfully reconstructed and opened to the public as a museum in 1996. Exhibits include original documents and portraits showing the history of the Wohnhaus building, Mozart’s compositions during his Salzburg years, and of the large social gatherings of the family. Special attractions include Mozart’s original fortepiano and the famous family portrait in the Dance-Master’s Salon Room. Separate areas in the museum are dedicated to topics such as the women in Mozart’s life, especially his sister Nannerl, and even sports shooting (Bölzlschießen) which was a popular pastime among the family, as well as info on the family’s extensive European travels. Make note of the white and yellow house (Makartplatz 1) on your right as you approach the Mozart Residence from the river. Local physicist Christian Doppler was born in 1803, who later went on to pioneer the “Doppler effect” which led to modern radar. Visiting Hours: Daily 9am-5:30pm; in July & August 8:30am-7pm; last entry an hour before close. Cost: Adults are 11€, or 18€ for a ticket that also includes Mozart’s Birth Place. Children are only 3.50€, and a family ticket is 23€. Website: Here. About Mirabell Palace Gardens: The Mirabell Palace Gardens (laid out in 1715-30) is one of the most playful areas of Salzburg and offers some of the best views of Old Town. The name Mirabell literally means beautiful view, so you know you’re in for a treat. The palace grounds are very famous for being laced with scenes from the hit movie The Sound of Music – especially from the song ‘Do Re Mo’. A visit to the Mirabell Gardens begins at the Southern entrance where two large pairs of Greek fencing statutes can be found leaping toward each other with their triumphant fists in the air. The figures were inspired by the ancient Borghese gladiator statues are among many carved pieces of art in the park. As you walk through the grounds, you’ll encounter several fountains, elegant statues, and plenty of colorful flowers. 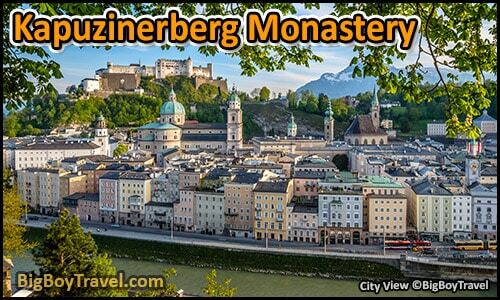 Make sure to turn around and check out the amazing views of Hohensalzburg Fortress towering over Old Town Salzburg. We’ll visit the fortress later on this free Salzburg walking tour. You’ll find one of the most iconic spots in the Mirabell Gardens, the Pegasus Statue Fountain, sitting in the Northwest corner of the grounds. This horse statue was moved here in 1913 after previously sitting in front of the Mozart Residence in Hannibalplatz (now Makartplatz). In the movie The Sound of Music, the Von Trapp children dance around this Pegasus Fountain (added in 1913) while singing Do Re Mi and using the nearby terrace steps as a musical scale. After inspecting their unicorn guards, climb the terrace steps just like Maria did in the movie for an epic view of Salzburg. Make sure to also follow the other set of steps near the Pegasus Fountain guarded by lions (Westside opposite the palace) across a small footbridge to the Dwarf Gnome Park (Zwergerlgarten). Commissioned in 1715, the statues were meant to caricatures making fun of Salzburg’s common people who weren’t even allowed in the park (became public in 1854). These statues helped to upper class to feel big while also creating an ugly balance to the large triumphant statues in the center of the park. 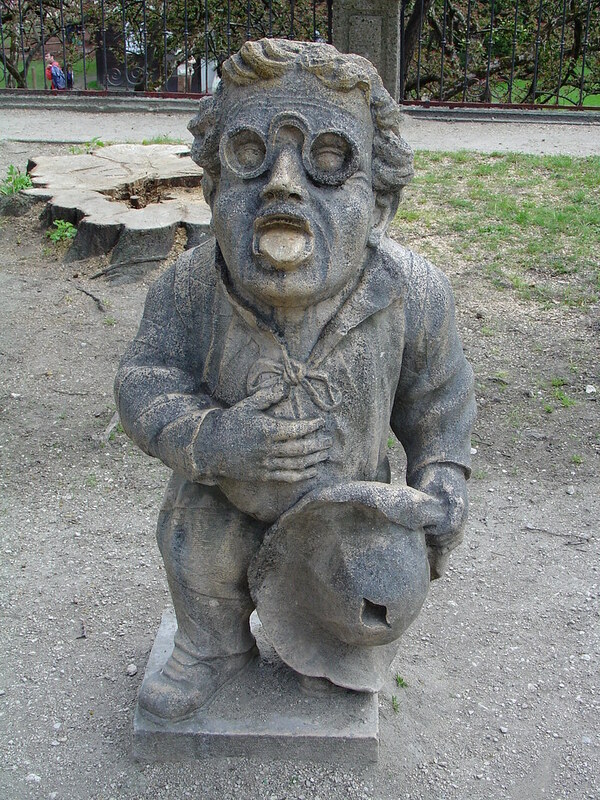 15 of the original 28 gnome statues in the park, and they are all said to have been modeled after real royal court dwarfs. All of the dwarfs are carved out of local marble (actually chalky limestone) from Untersberg Mountain whose small ice cave is fabled to hold the resting spirit of Charlemagne The Great. Each sculpture is fun and unique, but the dwarf with the glasses on was the one all the Von Trapp kids patted on the head during The Sound of Music movie. Near the Dwarf Garden is a long pergola vine tunnel and hedge maze which was also featured in the film. To learn more about the nearby movie sights see our Sound Of Music Movie Tour. Getting Here: You can easily walk from the main city center or take the bus, pretty much every bus line will have a Mirabell stop. Cost: The Gardens & Palace are free. Garden Hours: Main gardens open all year from Dawn to Dusk; the Hedge Maze and Dwarf Garden close each Winter. Photos: (Pegasus Fountain | Entrance | Garden View | Pergola | SOM Gnome). About Mirabell Palace: Overshadowed by the sprawling gardens, the Mirabell Palace itself was built in 1606 by Archbishop Wolf Dietrich Raitenau for his mistress Salome Alt whom he had 12 children with. Originally called Altenau Palace in her honor, the mansion was outside of the original city walls at the time and was considered a country escape for the not-so-secret couple. The Archbishop was expelled from office in 1612 his replacement tried to erase his memory by renaming the palace Mirabell after its beautiful views of Old Town. It is one of the top five viewpoints on our free Salzburg walking tour map. If you go inside Mirabell Palace, make sure to check out the 3-level staircase adorned with angel statues, in addition to the historic Marble Ball Room. In the Marble Ball Room, which is now used for weddings, Mozart performed piano concerts as a child. During Salzburg’s short modern stint as part of Bavaria (1810-15, was also Bavaria in the 700s), Prince Otto was born in Mirabell Palace in 1815 and later went on to become the King of Greece. The Palace has been owned by the city since 1866 and is used as offices including the Mayor of Salzburg. Palace Angel Staircase Hours: Daily 8am-6pm. Palace Marble Hall Hours: Monday, Wednesday, Thursday 8am-4pm; Tuesday & Friday 1-4pm. Photos: (Front of Palace | Palace Interior – Staircase Angels). About The Cemetery: The Saint Sebastian Cemetery (Sebastianskirche Friedhof) is home to the graves of Mozart’s wife Constanze and his father, Leopold. While the family graves are small, it is easy to find them near the giant Mausoleum. We love the outdoor corridors lined with statues and headstones. The entrance to Saint Sebastian Church (built in 1505) is a favorite among photographers as it has a very photogenic group of playful angel statues on a gate added in 1752. The church was also the parish that the Mozart family attended for most of Wolfgang’s time in Salzburg. If you aren’t into Mozart or are short on time feel free to skip the cemetery and go right to the next stop, but if you’re a history or classical music lover it’s only a block or so out of your way to get here. Visitors often say that this cemetery is one of the most peaceful places on our free Salzburg walking tour. Visiting Hours: Daily 9am-4pm; Summer stays open until 6:30pm. Photos: (Grave of Mozart’s Wife & Father | Mausoleum | Church Interior | Church Exterior | Angels). Church Website: Here. About Kapuzinerberg Monastery: Isolated on the Northside of the Salzach River, the Capuchin Hill (Kapuzinerberg) is the highest point in Salzburg and has some very rewarding views of Old Town. In 1594 the Prince-Archbishop of Salzburg established a monastery here for devoted Capuchin Order of Franciscan Monks inside the remains of the former Trumpeter Castle (Trompeterschlössel). The original building dates back to the 1200s (Fortified in 1405) to protect what was the town’s only bridge below and has almost eye-level views of the mighty Salzburg High Fortress perched above Old Town. A mild, winding stroll (or steep steps) will bring you up to the Capuchin Monastery (Kapuzinerkloster), located 1/4 of the way up the 2081 foot tall Kapuzinerberg Hill. During your hike up you’ll pass by a lot of interesting parts of the Medieval city wall and even scenes from the Passion of Christ in a small chapel built into the wall. During normal daytime hours, you are free to check out the monastery and learn more about the Monks’ way of life. As you can imagine being up so high, the stunning views of Old Town and the colorful buildings lining the Salzach River make it worth the short hike up. Sadly most tourists don’t go through the effort to get up the Hill and miss out and an unbelievable experience which is one of the best on our free Salzburg walking tour. In addition to the great views, and peaceful brown cloaked monks, you’ll love the decorative Gothic oak door at the monastery, which is a relic old Salzburg Cathedral after it was rebuilt in the early-1600s. The monastery is a good jump-off point if you are hiking further up the hill (0.8 miles) to Saint Francis Fortress (Franziskischlössl). In the 1600s, Franziskischlössl was built as a watchtower for the city wall and is now a restaurant. On your wooded hike to the top of the Kapuzinerberg Hill, you will cross multiple parts of the old Medieval city wall and hidden city viewpoints. The walls were re-enforced for protection following The 30 Years War which Salzburg managed to stay out of by basically paying their way out of the conflict. If you hike even closer to the top of the hill they have discovered two settlements from the Neolithic Period that date back to around 1,000 BC. These settlements are far older than even the Celtic findings and the Roman village of Luvaum (15BC-488 AD) which once covered Old Town Salzburg below. Terrace Hours: Daily from Dawn-Dusk. Monastery Hours: Monday-Saturday 6am-6pm; Sunday 8am-6 pm; Closed during Mass. Photos: (Monastery on Hillside | View From Monastery | Wall Carving). Monastery Website: Here. About Steingasse: Although it is a block off the water today, the Salzach River once butted up again the cobbled Stone Alley (Steingasse) until its flow was redirected in 1862-66. From Roman times through the Middle Ages, this created a natural fortification for the narrow roadway wedged between the river and the cliff of Kapuzinerberg Hill. The protection was vital as Steingasse was the main road into Salzburg from the South including the salt mines in Hallein. This route continued through Werfen and over the Alps onto Italy which helped Salzburg (Salt Castle) become very a dominant trading center. Wagons full of salt would pour into Salzburg following the river along the regulated Stone Alley before turning into Old Town along the Roman Bridge. This also made it easy to charge tolls along the way. As you stroll down the cobblestone lane, it almost feels like you are walking inside of a city wall. Our favorite feature of the Steingasse is the fortified Inner Stone Gate (Innere Steintor) which dates to 1280 (rebuilt in 1634) and had a drawbridge all the way until 1900. No wider than an alleyway, through Medieval times the street was home to many of Salzburg’s craftsmen whos trade required water access like potters, dyers, and tanners. The most notable people to live on the cobblestone Steingasse was the Joseph Mohr (#31) who wrote the lyrics to the timeless holiday song ‘Silent Night’ which premiered on Christmas Eve in 1818. You’ll see a plaque near the door in Mohr’s honor which is important for a city that prides itself on its Christmas traditions. The marker for Mohr’s home had been incorrectly placed at house #9 in 1968 due to an error in the 1794 Census, but was later moved to the correct house #31 in 2017. Across the street from Mohr’s home, you’ll notice a large chunk of stone is missing from the corner of another building. Local folklore says that this gash happened when a drunken American soldier tried to drive his tank down the narrow Steingasse on his way a brothel in WWII and got stuck. The historic House of Pleasure Brothel (Maison de Plaisir, #24) dates back to 1513 (same name since 1794) and is still open today. There is no doorknob, just a buzzer, a peephole, plus an eerie green light at night. The Violin Maker’s House (Geigenmacher, #25) across the street from the brothel was once a shop where Andreas Ferdinand Mayr made Mozart’s childhood violin in 1746, six years before the musician was even born. This violin can be seen on display at Mozart’s birth house later on this free Salzburg walking tour. As you wander through the pedestrian street, you’ll come across a lot of unusual doorways that are fun to photograph. Some of the doors have Medieval armor-like embellishments, a few have a door within a door, and others like house #2 have a charming coat of aged blue paint. You’ll also notice that many entries will also have chalk markings on them saying 20+C+M+B+18. These markings are a Catholic tradition usually put above one’s door to bless visitors on the 12th night of Christmas, also known as the Feast of the Epiphany. In Salzburg, they take this spirit to a new level and use the chalk marks to bless visitors all year. The 20 & 18 represent the current year, and the C, M, & B are the initials of the traditional names of the three wise men from the Bible known as Caspar, Melchior, and Balthasar. The initials also have a second meaning as they represent the Latin phrase Christus Mansionem Benedicat which translates to May Christ Bless This Home. The + signs are meant to be crosses that represent the protection of Christ. Photos: (Narrow Streets | Joseph Mohr’s Home Sign). 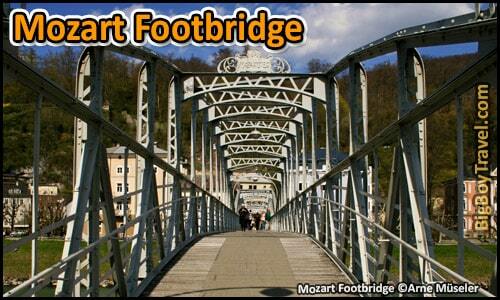 About The Mozart Footbridge: The pedestrian-only Mozart Footbridge (Mozartsteg) is named after Salzburg’s most famous resident and opened in 1903. 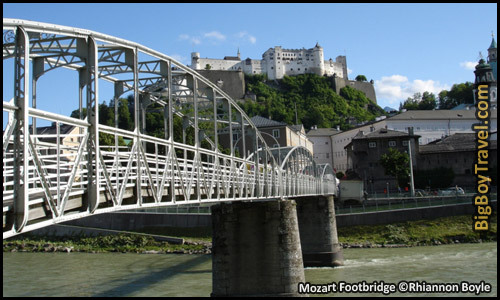 From the Northern bank of the Salzach River, you will great some of High Fortress gleaming over the steel arches of the Mozart footbridge. The riverbank near the bridge is also a popular place both either fish or relax in the grass. The Mozart Bridge was only the third built over the river into the heart of Old Town which is remarkable since Salzburg was started as the Roman village of Juvavum (15BC-488AD). From 15BC, the old Roman Bridge (römische brücke) was the only one to span the river and became covered in Medieval market stalls until it was replaced by the State Bridge (staatbrücke) in 1599AD. A second bridge wasn’t opened until 1859 when the first Caroline Bridge (Karolinenbrücke) was completed and was followed later in 1903 by the Mozart Footbridge. The Love Lock Bridge from earlier in this free Salzburg walking tour was the fourth to open in 1905. In the movie The Sound of Music, the Mozart Footbridge is where Maria and the kids skip across the river while pointing during the instrumental end to the song ‘My Favorite Things’. Along the bridge’s grassy riverbank, the children also skip along during the film scene. To learn more about the nearby film sights see our Sound Of Music Movie Tour. About Mozartplatz: With a giant statue of the city’s number one son, Mozart Square is the coolest place to enter Old Town Salzburg. Wolfgang Amadeus Mozart made Salzburg his home for the first 25 years of his life (1756-1781) before moving to Vienna, and the Mozart statue dominates the center of the square. When the statue was being added in 1841, the city found the foundations of two Roman Villas complete with 3 magnificent mosaic floors below the square. The top layer of mosaics had an inscription that read “Here lives the luck, nothing evil should be allowed” in Latin. Due to poor initial preservation, only 9 sections of the floors and an original color drawing of the findings remain today and can be viewed at the Salzburg Museum. The real highlight of Mozartplatz may be the exterior of the beautiful pink Church of Saint Michael which dates back almost 1,000 years before Mozart to 813AD. The inside of the church is a little bland to be worth your time, but the outside pop of color is excellent. During WWII, an air raid bomb blasted a hole just steps from the Mozart statue, but luckily both it and the church were unharmed. If you need to refuel for the rest of the free Salzburg walking tour, we suggest stopping for a coffee and pastries at the sprawling Café Glockenspiel. The cafe has a nice outdoor seating in the square plus a covered balcony area which are perfect both for people watching. From the balcony, we especially love watching all of the horse carriages that line up in Mozartplatz. About The New Residenz: Starting in 1587, the Archbishop started began opening up a new main square for Salzburg including the building of New Residenz (Neugebäude) on the square’s Eastside. The mansion-sized New Residenz replaced a tight grouping of Medieval homes, served as the Archbishop’s guest house, and today holds museum space. Notice the huge Glockenspiel Bell Tower sitting on top of the New Residenz. If you are lucky enough to be there when it chimes (7am, 11am, & 6pm) you will hear the Glockenspiel’s 35 bells from the 1600s ring out a tune set to match the current month. At the top of the Tower is a depiction of an upside down flaming heart surrounding the solar system is meant to symbolize God’s love for all of creation. Inside the New Residenz, there are a few different things to do that make it worth a stop. If you are looking for great local knickknacks and handcrafted items make sure to stop by the New Residenz’s Heimatwerk Shop. If it is a rainy day, consider checking out both the workshop and the Salzburg Museum of History and Art (website) inside the complex. There you can find many of the Roman artifacts that have been discovered from Salzburg’s early days at the as the settlement of Luvaum (15BC-488AD). The one thing you really shouldn’t miss, which is attached to the New Residenz, is the Salzburg Panorama 1929 (website) painted by Johann Michael Sattler. The Panorama boasts a series of stunning 360-degree panoramic paintings of how many European cities looked in the early 1800s. The mural of Salzburg is pretty straightforward, however, figuring out what European cities are in the others paintings is set up as a fun game. They even give you a cheat sheet so you can verify your answers after you’ve investigated the murals. Salzburg Museum Hours: Tuesday-Sunday 9am-5pm; Closed Mondays. Salzburg Museum Cost: Adults 8.50€; Kids 4€; Family pass 17€. Panorama Hours: Daily 9am-5pm. Panorama Cost: Adults 3€; Kids 1€. Glockenspiel Tower Hours: Carillon plays music Daily at 7 am, 11 am and 6 pm. Glockenspiel Tower Tours: March-October Thursday 5:30 pm, Friday 10:30 am and by prior arrangement. Glockenspiel Tower Cost: Adults 4€; Kids 2€. Panorama Website: Here. Museum Website: Here. About Residenz Square: Before modern Salzburg, the Residenz Square was once part of an ancient Roman Forum with an altar to Jupiter and a Pantheon Temple dedicated to all the gods. While the Forum was largely built over in the centuries after the Romans left in 488, modern excavations of Residenz Square have revealed a lot. Beneath the square, they found blocks from the time of Emperor Septimius Severus (193-211), ruins of Roman buildings, walls, a road, and a Weihealtar with inscriptions of the river god Iuvavus. A 4-foot-tall part of the Jupiter Altar (2nd or 3rd century AD) was found during renovations of the square in 2008. In 1587, the Archbishop of Salzburg leveled many Medieval homes that had been built over the Forum as well as a cemetery so he could expand his palace and open the area up into a large square with Italian style architecture. Originally called Main Square (Hauptplatz), this new space was lined with Baroque buildings as it became the heart of town and today still shows off the Archbishop’s Italian ambitions. Circling the square clockwise is pink Saint Micheal’s Church to the North, the New Residenz (Neugebäude) to the East, the Salzburg Cathedral (Dom) to the South, and the Old Residenz (Alte Residenz) to the West. The vast Residenz Square is well known to movie lovers as the place where the Von Trapp family performs ‘I Have Confidence in Me’ in the movie The Sound of Music. Maria enters through the Domplatz arches on the Southwest corner of the Residenz Square and splashes in the 45 foot tall Horse Fountain (Residenzbrunnen). The Horse Fountain is the focal point of the busy Square and is complete with a Triton which matches Bernini’s famous Triton Fountain in Rome. Completed in 1661, the Horse Fountain is considered the largest Baroque fountain located outside of Italy. The people watching in Residenz Square is fantastic as it if the center of everything Salzburg. There have been local painters setting up in Residenzplatz forever, and many of them even take on fake Italian last names so they can charge higher rates for their work. About Goldgasse: The curved and narrow Goldgasse alleyway gains its name from the goldsmiths that once had their shops here in Medieval times. While the prestigious shops along Goldgasse are still a little upscale today, this will be your first look at Salzburg’s picture perfect back lanes. For us, the highlight of the alley is the beautiful Gasthof Goldgasse Restaurant (website) which resembles an Alpine lodge inside. The restaurant has excellent meals and is one of our favorite place of this free Salzburg walking tour to get traditional Austrian food. They have lunch specials daily ranging from 11-19€ including a meal and dessert. Gasthof Restaurant Hours: Daily Noon-11pm; kitchen open until 10 pm; reservations suggested during lunch and dinner. Gasthof Restaurant Website: Here. About Old Market: The city gained grain market rights in 996AD (when Austria was formed), but it wasn’t until after Salzburg was granted political sovereignty from Bavaria in 1297AD that the Old Market Square really took shape. While it may seem tucked away today, the long Old Market (Alter Markt) served as Medieval Salzburg’s main marketplace. The location of the square was a vital gateway going back to Roman times as it directly lined up with the only bridge crossing the river into town from 15AD until 1859AD. We love the square’s Saint Florian Fountain which goes back to 1488 and has a statue of the Saint added in the 1700s. The weekly fresh produce market moved to University Square in 1857, but the Old Market (Alter Markt) is still great to visit as there are tons of shops and stands selling excellent tourist souvenirs. Some buildings of note around the square are Salzburg’s smallest house (#10a), and the old Royal pharmacy called the Hofapotheke (#6, website). The former Royal pharmacy dates back to 1591, has a beautiful Rococo facade which as added in 1777, and is fun to photograph. You will also want to check out the Café Konditorei Fürst (#13, website) where confectioner Paul Furst created the now world-famous Mozart Chocolate Balls known as Mozartkugel in 1890. We like to sit down at Cafe Furst for a coffee with our chocolate, but they have perfect sized mini-gift boxes of Mozartkugel available for sale if you are on the go. You can wash your chocolate down with an uplifting cup of coffee or a fancy ice cream drink from Cafe Tomaselli (#7, website) which is the oldest cafe in Austria. Frenchmen Johann Fontaine opened the first cafe in Salzburg on nearby Goldgasse in the year 1700, which was moved to the present location in 1764 and acquired by Carl Tomaselli in 1852. Cafe Tomaselli was a favorite of Mozart who would come here for their almond milk. Just off the Northwest corner of the Old Market is the slightly hidden Old Town Hall (Alter Rathaus). Built in the 1300s as a Citizen’s Hall, the city bought the building to use as the Town Hall in 1407 and added the bell/clock tower. The tower served as the lookout for the nightwatchman in Medieval times, and its clock also has a timeless moon dial. In 1618, the marble statue of Justinian was added above the door to represent the justice of the court inside. The Old Town Hall was given a Rocco-style facade in 1772, and the government offices later moved to Mirabell Palace in 1947. About Old Residenz Palace: When they call it the Old Residenz Palace, they aren’t kidding. There has been a mansion here for Salzburg’s Archbishop since 1120AD including the current one which was rebuilt in 1596 as part of an Italianate makeover. To enlarge the Old Residenz Palace and open up a new town square, the Archbishop had to tear down a bunch of Medieval homes and a cemetery which themselves had been built over an ancient Roman forum. Today you can tour 15 of the Palace’s elegant staterooms which are lavishly decorated plus a classic art gallery that has Rembrandt and Ruben paintings. Film lovers may remember that in the Sound of Music movie, the palace had a giant Nazi flag draped on the facade of the Old Residenz Palace facing the square. Hours: Wednesday-Monday 10am-5pm; Closed Tuesdays. Time Required: It takes about 30 minutes for the Staterooms and 45 minutes for the art gallery. Cost: Adults 12€; Kids 5€; Family Pass 22€. Guided Tours: 90-120 minute guided tours for large groups; audio guides are also available for smaller groups and individuals. Website: Here. About Salzburg Cathedral: The Salzburg Cathedral (Dom) is by far the biggest church in Old Town, faces 3 town squares at once, and is where Mozart was baptized. The original Christian parish on the grounds was completed by Saint Virgil (Bishop from 767-84) and was about half the size of the current Cathedral. This first parish was consecrated on September 24th, 774 when the remains of Saint Rupert were moved here and an annual festival still marks the day. Saint Rupert was the Bishop of Worms who came here in 696 to establish a new center to spread Christianity in the region. Rupert spent the next 20 years building churches and a convent in what remained from the then sparsely occupied Roman town of Juvavum which once filled all of today’s Old Town. While Saint Rupert’s work is considered the founding of modern town, the name Salzburg wasn’t used until after Bishop Virgil (from Ireland) took over the church building work of his predecessors and was in honor of the ancient fort that was on the site of Nonnberg Abbey. Bishop Virgil’s parish was subject many fires and expansions over the centuries and grew into a large complex including a choir, clergy house, a crypt, and cemetery. After a 10 year rebuild from a fire in 1167, the Virgil Dom become the mightiest Romanesque Cathedral North of the Alps. Another huge fire in 1598 led to church’s 8th re-build and the magnificent Baroque style Salzburg Cathedral you see today. The new cathedral was planned by Archbishop Wolf Dietrich Raitenau who was already in the midst of revamping the neighboring Residenz Palace and new square with help from an Italian architect. Some say he may have even been involved in the fire as an excuse to clear more room for his other building projects. Although he was anti-Protestant, Bishop Raitenau was expelled by Bavarian forces and imprisoned for life after refusing to join the Reformation’s Catholic League. The next Bishop was both a relative and nemesis of Raitenau, but also stayed out of the Catholic League and laid the cornerstone for the Cathedral in 1614 (opened 1628). It is a miracle that the new Salzburg Cathedral was built at all as most of Austria got swept up in Europe’s Catholic versus Protestant 30 Years’ War during the construction. While other cities were in the middle of this turmoil, Salzburg was able to rely on its rich salt production to have enough money to remain independent from the War. Because of their independence, Salzburg was able to build this massive Church while most other cities had to scale back on their building projects. Before entering the Salzburg Cathedral it is hard to miss the beautiful Virgin Mary (Madonna) Statue in Dom Square in front of the doors. While it appears odd that the Mary statue is looking away from the church, further inspection reviles that the statue is actually interacting with the Church’s facade. The two angels on the front of the Church are holding a crown and as you walk closer their relation to the Mary Statue give the appearance that they are actually placing the crown on her head. Moving closer to the Cathedral’s entrance you’ll notice large scene with the Statues of Four Saints (1600s) and three towering bronze gates (1900s). The 4 statues are of Saint Rupert holding a salt barrel, Saint Virgil with a church, Saint Peter with keys, and Saint Paul holding a sword. Statues of apostles as well as Moses and Elijah are further up the facade. The three gates are made to represent the Three Virtues (Göttliche Tugenden) and go from left to right: The Gate of Faith (Tor des Glaubens) the Gate of Love (Tor der Liebe), and the Gate of Hope (Tor der Hoffnung). Inside the entrance look for the bronze baptismal font (1311) with lion statues (1200) where Mozart was baptized. The most impressive part of the interior is the huge 233 foot tall dome which is painted into two eight piece sections depicting scenes from the Old Testament to go with murals of Passion of the Christ along the nave. During WWII a bomb crashed right through the dome, but luckily didn’t explode. Also awaiting the curious traveler is the working organ from 1703 that Mozart played during two years as the Church’s organist, an old tomb filled crypt with exposed pieces of the old Romanesques foundations from both 774 and 1167, plus an interesting Cathedral museum (website) covering 1300 years of history. While the modern 4,000-pipe organs impressive, the 7 huge tower bells (2 from the 1600s) are a real treat. The group of bells is considered the finest sounding in Austria and among them, the Salvator Bell, is the second largest in Austria weighing 14 tons. Hours: Monday-Saturday 8am-6pm & Sundays 1pm-6pm; Summer months open until 7pm; Winter Mondays closes at 5pm. Cost: Free, however donations requested. Mass: Sunday 10am. Organ Performance: June-Sept Wed & Sat 11:15am for one hour. Museum Hours: Wednesday-Monday 10am-5pm (last entrance 4pm, closed Tuesdays); Open daily in December; July & August also open daily until 8pm. Museum Cost: Adults 10€, Kids Free. About Kapitelplatz: The vast Chapter Square (Kapitelplatz) is named after the high clergy of Salzburg Cathedral who lived here in the Cathedral Monastery (Domkloster) through Medieval times. When the monastery was disbanded in 1803, it and the rest of the square was opened up revealing glorious wide-angle views of the High Fortress above. Today Chapter square is very festive hosting music and artist events, a huge beer tent during some holidays, outdoor movies in the Summer, and has a number of very interesting sights. The Chapter Square is also where Maria catches the bus from Salzburg to visit the Von Trapp Family for the first time during the hit 1965 film The Sound of Music while singing “I Have Confidence”. 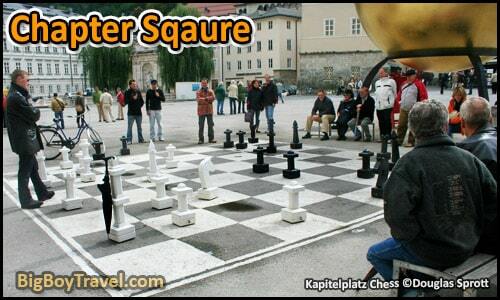 The first two things to check out in Chapter Square are the giant over-sized chess board with two-foot-tall pieces and a 30-foot-tall yellow orb sculpture topped with a man standing on top. Called Sphaera, the orb was made in 2007 by artist Stephan Balkenhol as part of a series of works with the same male figure across Europe (Mann on Giraffe, Mann on Stump, Mann on Elk). If you’ve been to Munich Germany’s city center, you may have noticed the same male figure from this Salzburg sculpture walking off a steel beam in another of the Balkenhol’s works. Locally the work is called Mann auf Mozartkugel after the famous round local treats made out of chocolate you may remember from earlier in this free Salzburg walking tour. Continuing through Kapitelplatz Square, you’ll run into a medieval Horse Bath Fountain (Kapitelschwemme) from 1732 AD which is framed by two lovely trees. Nowadays the Horse Bath is more of a well and pond, but back in the 1700s it served as the equivalent of a full-blown car wash for your horse. The area around the fountain is also an excellent spot for photos of the High Fortress on the hilltop above you. If you have been looking for a bathroom, there is a public restroom under the archways separating Kapitelplatz from Cathedral Square. Also under the archways, opposite the bathrooms, is the Coat of Peace copper statue by artist Anna Chromý which is one of our favorite hidden gems of Salzburg. Photos:(Chess Board | Horse Bath). About Stieglkeller: The Beer Hall that locals recommend the most to us is the historic Stieglkeller which is elevated 1/4 the way up the side of Mönchstein Hill. Partially shaded by trees, the multi-leveled beer garden has room for over 1000 guests and almost every outdoor table has a great view of Old Town Salzburg. It is a perfect place to rest your feet and grab a beer on a warm summer afternoon. The inside of the Beer Hall is decorated to look like an old hunting lodge and has good traditional food. One of the main reason locals love Stiegl so much is that they opened their brewery in Salzburg in 1492 and are the largest brewery in Austria that is still privately owned. Located on the South of Mönchstein Hill, you can visit the Stiegl Brewery and museum for daily tours. There are two other very popular beer halls and beer gardens in Salzburg. The Sternbraeu off of Getreidegasse Street, but it does not have the same commanding view as StiegKeller. There is also the classic 1,000 seat Bräustübl Tavern attached to a monk’s brewery from 1621, which is our overall favorite and where we will end this Old Town Salzburg walking tour. StieglKeller Hours: Daily 11am-10pm; open until 11pm in Summer. Website: Here. About The Funicular: There has been a lift up Mönchsberg Mountain to Hohensalzburg Fortress since at least two decades before 1515AD and a modern funicular since 1892. It is by far the easiest way to get up the cliff side as it turns a very steep hike into an easy 54 second ride. The glass enclosed cars can carry 55 people per trip and service 1.7 million visitors a year. Hours: Varies but usually 8am-Midnight. Cost: 2-4€. Your ride will be added onto your ticket for Hohensalzburg Fortress. Website: Here. About High Salzburg Fortress: Since 1077 AD, this castle-like High Salzburg Fortress (Hohensalzburg) has been towering over Salzburg from Mönchstein Hill offering an ever steady sense of protection. Thanks to an expansion around 1500 AD, Hohensalzburg is one of the largest fortifications in Europe and one of the only ones never over taken by force. With views grand enough to match The High Fortress’ massive scale, the castle has easily become Salzburg’s number one tourist attraction. Hohensalzburg holds a decent Fortress Museumand Medieval Prince Apartments which are worth a visit, but the best room is the gilded, Golden Fortress Room. Even if you are short on time at least stop to take in the 360 degree views which let you see all over Salzburg and even all the way to the Alps toward the South. Hours: May-September 9am-7pm; October-April 9:30am-5pm; last admission 30 minutes before close. Cost: With Staterooms and funicular Adults are 15.50€ and Kids 8.70€. You can save a couple euros by hiking up and a couple more by visiting by 10am during peak season. Website: Here. About Saint Peter’s Cemetery: The beautiful Saint Peter’s Cemetery has been in use since before 700 AD, and its cliff-side catacombs go back even further to 215 AD. With wrought -iron headstones, this beautiful flower-filled cemetery may be the most peaceful stop on our free Salzburg walking tour. You can even get some get vantage points in of the Salzburg castle high above you as you stroll among the tombs. In the beginning, Saint Peter’s Cemetery was reserved only for the burials of monks living in the neighboring monastery until it was opened to the public in 1454. The oldest surviving headstone is from 1288 AD, and the cemetery is also where Mozart’s sister Maria Anna and composer Michael Haydn are buried. You can find their graves in the entrance to the catacombs explained next on their free Salzburg walking tour map. There is even an American buried in the cemetery as Major General Harry Collins, who was the commander that liberated Dachau Concentration Camp in 1945, met his second wife in Salzburg and moved here after the war. Our favorite graves are the 7 tightly clustered iron cross headstones from the 1700s for the Stumpfegger family. Local folklore save that Sebastian Stumpfegger murdered his 6 wives and they are all buried there together. In reality, the graves are for the stonemason Stumpfegger, his parents, and his 4 wives. None of the wives were murdered and 3 of the 4 died in childbirth which was very common at the time, even more so since Stumpfegger had 21 kids. The most interesting thing about Saint Peter’s, unlike most cemeteries around the world, is that you do not buy the plots but instead rent them. Relatives of the dead must pay rent for each plot every 10 years and must also be the caretakers. If your family doesn’t pay your rent, the church tosses your body out. In the center of the cemetery is the Gothic-style stone chapel which was dedicated to Saint Margaret in 1170. Now used as a mausoleum, the church was originally built as Amandus Chapel around 700AD by Saint Rupert before being rebuilt in 1170 and again in 1491. In the mid-1600s, iron-gated arcades holding private family tombs were added ringing the cemetery. In the 1965 movie (and 1959 play) The Sound of Music, these archways and headstones were depicted as where the Von Trapps hid from Nazis during their escape, although the actual scene was filmed in Hollywood. Behind the arcades on the Eastern side of the cemetery is the Saint Peter’s Bakery which is the oldest in town going back to 700 and is famous for its sweetbread. Cemetery Hours: April-September 6:30am-7pm; October-March 6:30am-5:30pm. Cemetery Cost: Free. About The Catacombs: While touring the cemetery, you may also notice a number of window-like holes along the Southern cliffside in the cemetery which are the now empty catacombs. As the Roman’s carved away stone to build their city of Luvaum (15BC-488AD) part of the cliff-side started to be used by early-Christians for assembly and hermitage as early as 215AD. Because the Pagan Romans used cremation and didn’t allow burials inside of town (except for Emperors), the catacombs likely weren’t used for the dead much or at all until after the Empire adopted Christianity in the 300s. Near the entrance to the catacombs are the graves of Mozart’s sister Nannerl and composer Michael Haydn. After climbing stone 48 steps you find chapel of Saint Gertrude (died 659) dating back to 1178 and 36 steps further up is the chapel for Christian martyr Maximus (died 250). both of the cliffside chapels were dedicated by Archbishop Conrad of Wittelsbach in the 1170s. Seeing the mainly bare underground catacombs requires hiking up a lot of stone steps carved inside the cliff, but the views of the cemetery below are stunning. Catacombs Hours: May-September Daily 10am-6pm; October-April Daily 10am-5pm; Closed on holidays. Catacombs Cost: Adults 2€; Kids 1.50€. About Saint Peter’s Abbey: Saint Peter’s Abbey was established by Saint Rupert, who is considered the founder of modern Salzburg, in 696AD. Saint Rupert (Frankish missionary & Bishop of Worms) was given this control of this former Roman town of Juvavum (15BC-476AD) by the Duke of Bavaria (Theodo) to revive it into a Christian stronghold. This spot was chosen for his church as there had already been an abbey for monks established here by Severinus of Noricum (410-482) in as early as 450AD. Officially established in 696, Saint Peter’s Abbey is the oldest church in Salzburg and is also the oldest continuous monastery in the German-speaking world. Before his death in 710, Saint Rupert also started a second small abbey on the site of today’s Salzburg Cathedral (Dom, established in 774), Amandus chapel (now called Saint Margarets) in the Saint Peter Cemetery, and other churches in the region which earned him the title of Patron Saint of the Salt Miners. Rupert’s own sister Erentrudis was inspired to build Nonnberg nunnery on the towns original fort in 711 which is world’s oldest continuous Christian women convent. Two of the sons of the Duke of Bavaria (Theodo) who sent Rupert to establish churches ruled Bavaria out of Salzburg (702-725) instead of Regensburg to see the work be sustained. From 739- 987, the abbot of Saint Peter’s Church was automatically Bishop of Salzburg and even after that changed the monastery remained the residence of the Bishop until 1110. Today’s Romanesque version of Saint Peter’s Church was built in 1130 (dedicated in 1147) before getting its iconic steeple onion dome and Rococo-style interior in the mid-1700s. The interior is the real treat of any visit to Saint Peter’s and the narrow nave is lined with Goliath-sized painted canvases under a muraled ceiling. There is also a painting museum area from the 1600s known as the Long Gallery, but the impressive walls of the main nave are more interesting. Next to the altar where Saint Rupert is entombed are the tombs of Mozart’s sister Maria Anna Mozart and famous composer Johann Michael Haydn. The monastery’s 10,000 book library is the oldest in Austria including over the 800 old-world manuscripts with the most precious being the Verbrüderungsbuch, brought here in 784 by Bishop Virgil. In the square facing the entrance to the abbey is a central statue of Saint Peter looking up to the steeple while praying. Along the north side of Saint Peter’s Square, you can see an excellent vertical sundial on the archway leading to the Franciscan Church which we will visit soon on our free Salzburg walking tour. 360 Degree Tour: Amazing virtual tour here. Church Hours: Daily 8am-Noon and 2:30-6:30pm; No visits during mass. Church Website: Here. About Saint Peter’s Restaurant: In addition to the historic bakery from 700AD, Saint Peter’s Abbey is also a destination for food lovers with their Stiftskulinarium Restaurant. Widely considered Europe’s oldest restaurant, Alcuin of York, an English scholar attendant (liegeman) of Emperor Charlemagne ate here first documenting the restaurant in 803AD. The restaurant was later heavily written about starting in the 1300s and began extremely popular with nobility, the bourgeoisie, and the clergy by the 1700s. Over time Saint Peter’s Restaurant has grown to have multiple dining rooms throughout numerous rooms of the former Benedictine monastery. There are 11 dining rooms inside Saint Peter’s Restaurant and we have three favorite spaces. The amazing Felsenstube Room is one of the oldest in the restaurant, is chiseled out of the cliffside hundreds of years ago, and is used for wine tastings. Our other favorites are the exposed brick vaulted Rardstube Hall which was the wine cellar 1200 years ago and the Gothic-arched Innenhof Courtyard is one of the most timeless spaces you’ll find in Salzburg. During the Christmas season, the Innenhof Courtyard is beautifully decorated like a wonderland to celebrate Advent complete with a gluhwein (hot mulled wine) stand. Micheal Haydn, who was one Mozarts friends, the creator of the modern string quartet, and the little brother of famous composer Joseph Haydn also lived on the restaurant’s second floor (1760-63). A dining hall named after him now takes up Haydn’s former room. In 1809 French troops were even housed in the restaurant during Napoleon’s invasion. The Saint Peter’s Restaurant is world-renowned for its nightly Mozart Dinner Concerts (more info) in their Baroque Ballroom which have been taking place since 1996. Having seen the wonderful concert ourselves, we feel that it’s a splurge that is easy to justify with the highly talented singers & musicians, authentic 1700s-style costumes, and the perfect ballroom setting. It’s hard to come to the city of Mozart and not want to hear some authentic performers doing his music. Restaurant Hours: Daily 11:30am-11pm (reservations highly recommended). Restaurant Website: Here. Mozart Concert Time: Night at 7:30pm; lasts 2.5 hours; doors open one hour early. Mozart Concert Cost: 63-73€ with a 3-course meal (drinks not included). Mozart Concert Website: Here. About Franziskanerkirche‎: There has been a church here since 1139, but it is the current Gothic-style one that will make your jaw drop. You’ll enjoy trying to wrap your head around the scale of the forest of columns holding up the uniquely designed vaulted canopy of a ceiling. The breathtaking beauty is impossible to get into one photo unless you have a fish eye lens. The interior is pretty bare as all of the color and attention is meant to be drawn to the gilded Virgin Mary alter in the center of the Church. Church Hours: Daily 6:30am-7:30pm; No visits during mass. Church Website:Here. About The Festival Hall: The three-block-long Festival Hall complex is home to three performance theater and was the site of some of the best scenes filmed for The Sound of Music. After the Saint Peter’s Benedictine Convent was closed (1125-1583) the Prince-Archbishop of Salzburg, Wolf Dietrich von Raitenau, had the Royal Horse Stables (Hofmarstall) built on the Western end of today’s complex over ten years starting in 1599. The stables held over 150 horses and were later expanded Eastward with an indoor Winter Riding School in 1662 and an open-air Summer Riding School carved into the cliffside in 1693. The riding school quickly became important to Salzburg’s upper class for horse training and riding competitions similar to the Spanish Riding School in Vienna. For the 5th annual Salzburg Festival in 1925, a section of the former horse stables complex was re-built as the Small Festival Hall Theater (Kleines Festspielhaus) and became the new home for the event. The following year the former open-air Summer Riding School area was turned into a second performance space for the Salzburg Festival. Originally carved out of the stone cliffside in 1693 in a former quarry, the space has an impressive 3-level, 96-box viewing gallery and is well-nicknamed the Rock Riding School (Felsenreitschule). We love how the arched portal stone wall looks like a gladiator arena especially since Salzburg was originally a Roman town called Luvaum (u-va-voom) established in 15BC. Now serving as the lobby for the Rock Riding School Theater, the massive Karl Böhm Hall was the original indoor winter riding school built in 1662. This vast space is highlighted by a 600 square meter ceiling mural painted in 1690 depicting Turkish military exercises on horseback. The open-air Rock Riding School theater gained a partial roof (now fully retractable) in the 1930s and is where the real-life Von Trapp Family Choir won the singing competition in 1936. Although the family had left Salzburg before the first Salzburg Festival under Nazi occupation in 1938, the Festival Hall was used in the filming of some key scenes in the 1965 movie The Sound of Music. In the film, the Von Trapps perform a melody mashup on the stage before then Captain sings ‘Edelweiss’ with help from the audience followed by the family joining in ‘So Long, Farewell’ before they exit and make their escape. During their conversion into theaters, the Small Festival Hall and the Rock Riding School were connected with a large foyer completed covered in beautiful frescoes. While the Nazis covered up the frescoes during their WW2 occupation of Salzburg, they were thankfully brought back to life in 1956. After a lot of work, the painted lobby and original indoor theater (Small Festival Hall) were renovated as the new House for Mozart (Haus für Mozart) in 2006, celebrating 250 years since Mozart was born in Salzburg. A third theater was added onto the complex in 1960 known as the Large Festival Hall (Großes Festspielhaus) which has one of the largest stages in the world at 100 meters wide with steel plate backdrop. You can still see some of the original entrance arches on the outer walls in the foyer leading to the Large Festival Hall Theater as well as on the Western exterior of the complex. Address: Hofstallgasse 1. Guided Tour Cost: Adults 7€; Kids 4€. Guided Tour Hours: 50 minute guided tours are at 2pm daily (also 9:30am, 2pm & 3:30pm in July & August). Photo: (Exterior from the West). Website: Here. About University Square: Salzburg’s main open-air market sits in the vast University Square with growers from all over the region selling delicious produce. Known as the Green Market (Grünmarkt), it was established in 1857 and is still open daily. We recommend recharging here by buying some fruit and taking a short break to do some people watching. On the Southside of University Square is the massive Collegiate Church which was started in 1694, but took over 70 years to fully complete as the original builder went blind a few years into the project. This cathedral was where Mozart premiered “Mass in D minor” on February 5th, 1769 which is one of his prettiest arrangements. While the size of the white Church is awesome, the interior is fairly bland. Tucked away along the West side of the Church is a large grassy square called Prince′s Park (Furtwänglerpark) which was once part of a Franciscan Monastery then by the 1600s the University of Salzburg. With most of Salzburg’s squares paved over since Medieval times, there aren’t many huge green spaces like this in the heart of Old Town. Turning around to the Northside of University Square, you’ll see numerous windows on the backside of Mozart’s Birth Place House (Universitätspl #14). We will visit Mozart’s house next on this free Salzburg walking tour and it gives you some great elevated vantage points to admire the scale of Collegiate Church towering over the square. We love to exit University Square toward Grain Lane (Getreidegasse) through the narrow Medieval pathways connecting the two streets called Through House Alleys (Durchaus). There are more than ten covered alleyways all filled with shops, but our favorite is Roittner-Passage which connects Universitätsplatz #15 through to Getreidegasse #7 via a gorgeous courtyard. Outdoor Market Hours: Monday-Friday 7am-7pm; Saturday 6am-3pm; Sunday Closed. Church Website: Here. About Mozart’s Birth Place: On January 27th, 1756 one of the true pioneers of Classical music was born in this very home, Wolfgang Amadeus Mozart. You simply can’t miss the home with its bright yellow facade and large groups of tourists milling around the entrance. This museum is by far the most visited Mozart landmark in Salzburg. The three stories of interesting exhibits are labeled in multiple languages and take about 90 minutes to get through. Everything starts on the 3rd floor where you are introduced to the different members of the family and even get to check out the room Mozart for born in. The 2nd floor primarily focuses on Mozart as a composer of operas. There are a ton of set models and costumes from his operas, plus excerpts from Mozart’s most famous operas for you to listen to. We especially love the different musical instruments that are on display including one of the famous violins Mozart performed with. The 1st floor and final floor is dedicated to everyday life of the family both while at home and while traveling. The collections included 18th-century travel utensils, original documents, and paintings telling the Mozart family’s story in Salzburg and abroad. A few of the rooms are staged with period furniture to help give you the atmosphere of the age. Hours: Daily 9am-5:30pm; in July & August open until 7pm; last entry 30 minutes before closing. Cost: 10€ for Adults; 3.50€ for kids; 21€ for a family ticket. Combo ticket available with his adult home. Guided Tours: While the Museum is mainly self-guided and takes 90 minutes, you can book a staff-guided tour as well for 66€ per group. All staff tours must be booked at least 2 weeks in advance. Website: Here. About Getreidegassee: Grain Lane, or Getreidegasse (pronounced Ga-try-Da-gah-sa), is the main shopping street in Salzburg since Medieval times. It is complete with high-end stores like Louis Vuitton, many jewelry stores (schmuck), and even a very fancy McDonald’s which has silverware and outdoor seating. You can really see the Medieval roots of this compact pedestrian street by the signage that hangs above each shop. In the Middle Ages almost no one could read so instead of having signs with business names on them, the shops would hang an icon for their trade or craft. Notice how the signs for the hat maker, locksmith, umbrella shop and many more have kept this signage tradition alive. One of the best parts of this free Salzburg walking tour is getting lost among the shops on Getreidegasse for a good hour and it’s even better if you stop by any of the roadside gelato stands for a delicious treat. At the beginning of Getreidegasse Street is a very inviting bar known for its schnapps drinks called the Sporer Schnapps Pit Stop (No 39, website). Sporer has located in the building since 1905 and their staff very English-language friendly. If you like what they have to offer you can even buy an eighth of a liter (achtel) of schnapps to bring with you. It’s crazy to think that there have been homes documented on the site of the Sporer shop going back to Roman times in 174AD with the current house dating to 1407. Even if you aren’t shopping make sure to stop into the active Wieber Blacksmith Shop (No 28, Facebook) to get a real life look into the trade as local craftsmen hammer their red-hot creations into an anvil. They make everything from custom keys, modern works, and the decorative outdoor signs that adorn the street’s shops. There has been a blacksmith here since 1415AD and the current shop is on its 4th generation of owners. Make sure to also check out the Sound of Music World Museum at the western end of the lane (No 47, website) which is run by the same group that manages the Von Trapps family’s real-life home in Salzburg. Sporer Shop Hours: Monday-Friday 9:30am-7pm; Saturday 8:30am-5pm; Closed Sundays. Blacksmith Hours: Monday-Friday 7:30am-5:30pm; Closed Saturday & Sundays. Sound Of Music World Hours: Daily 10am-6pm. About The Horse Bath: Hugging the side of Mönchsberg Hill is Salzburg’s largest Medieval horse bath (Pferdeschwemme) which in the Middle Ages were like car washes for horses. Because this horse bath was part of the neighboring Royal Stables (Hofmarstall), the Prince-Archbishop had the mural backdrop and statue of a horse being tamed added to the sprawling fountain in 1693. In the movie The Sound of Music this was where Maria and the kids danced around while singing ‘My Favorite Things’. There are actually two of these Medieval horse baths remaining in old town Salzburg with the larger painted one located here which was part of the Royal Stables (Marstallschwemme) and a smaller one in Chapter Square (Kapitelschwemme) from earlier in this free Salzburg walking tour with a beautiful fountain drooping trees. Like all of the fountains in Salzburg, this one is fed by a series of underground water canals said to go back to Roman times which were later revamped in both the 700s and the 1200s, long before most of today’s Baroque structures were built. About Winkler Terrace: High above the West side of Salzburg on Monks’ Hill (Mönchsberg), the breath-taking Winkler Terrace has stunning panoramic views of Old Town. The amazing view from the stone terrace was highlighted in the movie The Sound of Music during a number of scenes including the song Do Re Mi. The neighboring M32 Cafe (website) was once Cafe Winkler before the Modern Art Museum (website) was built here, but the terrace has been preserved. Overall our experience visiting the cafe has been very negative as it is the only place in Salzburg we have ever got really bad service and it has happened to us three times here. That being said, we suggest going up for the city views on the sprawling terrace which is free but if you want coffee or food then visit either the nearby Stadt Cafe next to the Militia Wall which also has amazing views or check out the fancy Schloss Mönchstein Hotel. Both of these alternatives are explained next on our free Salzburg walking tour. Getting Up To Winkler Terrace: The most accessible way up is the Mönchsberg Elevator which sits behind the Salzburg Museum and takes you directly to Winkler Terrace. Look for the pink row house along the cliff with a large MdM above the entrance. The elevator is fully inside the cliff while the tube-like tower on the side is actually the Gstätten Tower. Alternatively, can take a taxi to up the backside of the cliff to M32 Cafe or the stairs at Toscaninihof (behind the Festival Hall) to the top of Mönchsberg and reach the terrace with a 15-minute walk. Elevator Hours: Tuesday-Sunday 8am-9pm; Monday 8am-7pm. July & August Daily 8am-11pm. Elevator Cost: Adults 2.30€ one way or 3.60€ round trip; kids half off. Modern Art Museum Hours: Tuesday-Sunday 10am-6pm; Wednesday 10am-8pm; Closed Mondays. Museum Cost: 8€. Photos:(View From Terrace | View From Cafe at Night | Schloss Mönchstein | Johannesschlössl). About Bürgerwehr: Near the Winkler Terrace is the amazing the timeless fortified Militia Wall (Bürgerwehr) which was built on the hilltop from 1465-80 to protect the West side of Salzburg. This is the only place in Salzburg with the remnants of the Medieval city wall really feels mighty as it is over forty feet tall. Other defensive structures on top of the cliff top include the Mülleggertor Gate (1280), Frey Palace red tower (Roter Turm-1278), and eventually wraps around to the High Fortress from earlier on this free Salzburg walking tour. While you stroll along the ramparts of the Burgerwehr wall, the small Stadt Alm Cafe (website) is one of our favorite places to get coffee in Salzburg. Located inside a small hostel, Stadt Alm still has decent views with plenty of seating, but less crowded and less expensive than the M32 Cafe (horrible service) on Winkler Terrace. About Castle Mönchstein Hotel: The beautiful Castle Mönchstein (Schloss Mönchstein) was first documented 1350AD as the Tetelheimer Tower (Tetelheimer Turm). For the most part, the tower served as a home and fort until Saint Peter’s Monastery acquired the property in 1654 as a retreat for its professors. During this period the tower was expanded and called the Professors Castle. What is now the tower room on the castle was then used as an astronomical observatory. Castle Mönchstein was turned into a luxury hotel in 1948 and has gone on to win countless castle hotel and restaurant awards. It is one of our favorite castle hotels in the world and a great place to stay in Salzburg. Even if you can’t stay here, walking past the castle and the grounds are pretty impressive. About The Augustiner Beer Hall: There is no better place to end a long Salzburg walking tour than an amazing Augustiner Beer Hall (Bräustübl) that has been open since 1621 AD. The beer is even older as before coming to Salzburg, the Augustiner monks opened a brewery in Munich in 1328. Over the centuries the monks perfected brewing and their light beer (Helles) is our favorite. Out of the beer hall’s 1500 seats, we like hanging out in the outdoor beer garden section the most. When choosing where to sit there two types of service, Waiter Service (bedienung) and Self-service (schank) where you wash your own cup at the cleaning fountain (krüglwasch brunnen) before getting your beer. The mugs themselves are a great throw back as it is one of the only places still serving beer in traditional ceramic beer steins. Waiters do not serve food, but as long as you purchase a drink mug you can bring any food you want with you. You can either bring your own food with you picnic-style or hit up the deli upstairs for a great selection of pizza, deli meat, and cheese. Depending on how early arrive, consider touring the brewery to see what happens behind the scenes and get an exclusive tasting. Tours run Monday-Friday afternoons with advanced booking for 13.90€ per person. They require a minimum of 10 people, but you may be able to join an existing group, online booking here. From the tavern you can easily walk up the back side of the Monchsberg Cliff to get a great night time view of Salzburg. The Mönchstein elevator closes after midnight, so if you are trying to get into Old Town from the cliff viewpoint late at night you will need to back track to the Bräustübl Tavern and follow the river back. Hours: Monday-Friday 3-11pm; Saturdays-Sundays and public holiday 2:30-11pm. Photos: (Traditional Stein | Wooden Kegs | Slideshow from Brewery). Website: Here.